"...We ask that alumni be viewed as a key stakeholder group alongside faculty, staff and students; that the alumni voice be celebrated; that we be engaged at meaningful points in time; and that Western reaches out to us on matters of institutional priority. "…Western plays on a global stage but its local role is also more important than ever before as an essential part of the City of London that makes significant contributions to our economy and community. Western is one of London’s most prominent institutions, largest employers and a primary magnet of talent into our community." Western cherishes its longstanding ties to its home in London, and we are highly cognizant of the importance of relationships with key local stakeholders and institutional partners. These groups include: some 277,000 alumni who live around the world and are represented by the Alumni Association; current students represented by the University Students' Council and the Society of Graduate Students; Western's 8,200 faculty and staff members represented by various unions and employee associations; the City of London; our three Affiliated University Colleges; Fanshawe College; affiliated teaching hospitals and health research institutes; local First Nations communities; community organizations and social service agencies. This list is far from exhaustive. We also take enormous pride in our physical setting in London, which plays a significant role in recruiting and retaining students, faculty and staff from across Canada and abroad who share our appreciation for the beauty, safety and friendliness of our campus and surrounding community. maximizing the ability of professional school graduates to link to their professional communities. Seeking mutual points of advocacy with our unions, employee and student groups: We commit to working with the various constituency groups on campus to find mutual points of advocacy that will strengthen the high quality of Western's teaching and research and increase Western's profile on the global stage. Contributing to London's social, cultural and economic development: Western reaffirms its strong and ongoing commitment to playing a leadership role in contributing to the high quality of life enjoyed by citizens of London and the regional community. The University's direct points of interaction with the City and community are both countless and varied. As one of London's largest employers, Western generates—conservatively reckoned—an estimated $2-billion in economic activity annually. Along with the 8,200 faculty and staff employed on campus, Western and its Affiliated University Colleges attract 6,400 first-year undergraduates each year, in addition to more than 31,000 upper-year, graduate and postdoctoral scholars who count among the brightest young minds in the country. Western will continue to explore with the City of London and other community organizations mutually beneficial initiatives that contribute to the city's quality of life and advance the teaching and research mission of the University. Partnering with educational and research institutions at home and abroad: To advance our goals, Western believes that it can achieve more by partnering with other educational and research institutions than what it can achieve by going it alone. In advancing Western's teaching and research priorities, we will pursue select opportunities to partner with institutions through which mutual benefit can be achieved. Improving accessibility and success in higher education for Indigenous peoples: Western has undertaken many activities to strengthen its relationship with regional Aboriginal communities. This began with the establishment of the Aboriginal Education and Employment Council (AEEC) in 1991 (renamed in March 2014 to the Indigenous Postsecondary Education Council - IPEC), which highlighted a commitment, articulated again in Engaging the Future in 2006, to developing distinct initiatives for recruiting and supporting Aboriginal students. Today, Western is home to approximately 450 students who identify themselves as being of Aboriginal ancestry and whose presence and activities contribute significantly to the cultural diversity of our campus community. 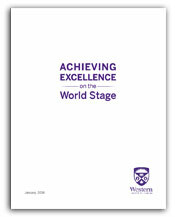 Looking ahead, Western reaffirms its commitments to making higher education more accessible to Indigenous peoples, to improving the learning experiences and success of Indigenous students, to hiring and supporting the success of Indigenous scholars and staff, and to improving the well-being of Indigenous peoples through ethical research and social involvement. To accomplish these important goals, Western looks to partner with the IPEC to develop an inclusive multi-year Indigenous Strategic Plan that will encompass key priorities over the next five years.